I have interacted with various successful analysts over last 7 years. During these interactions, I found out some common habits in them. After observing these habits, I have tried ways to inculcate these habits myself. 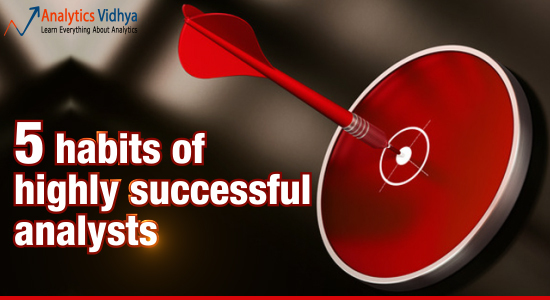 Some of these habits were also emphasized by my mentors, while the others were learnt the hard way! Is there a better way to structure this problem? Will that make the solution better or more intuitive for business? Is there a better way to present / summarize the findings of the project? How can I visualize the outcomes in best possible manner? Instead of simply highlighting the insights from a project, can I use these insights and chalk out business actionables? Can I size the impact from these actionables and tell them to business upfront? Is there any aspect of analysis I might have ignored? Is there any implicit assumption I have made which is impacting the result? Remember, the value of analytics is recognized through the value it generates for the business and the amount of time spent asking these questions will have direct impact on the business value created. There have been times when I have changed the presentation flow, performed additional analysis, verified and re-verified all the numbers / insights till the night before project presentation. All of that is done to make sure the project creates the impact it deserves. And, nothing beats the feeling you go through after creating that impact. So, don’t leave any stone un-turned and make sure there are no gaps in your thinking on every project you work on. Habit 2: Segment, till you can! Successful analysts never work on averages. Every time they see an average, they think if there is an underlying segmentation at work, which could explain things better? By not segmenting the average, there is value left on table. Successful analysts never do that. This article contains various examples and the way to create a segmentation. As an analyst, you deal with numbers day in and day out. You need to pick out that one cell in which the formula is wrong from a file containing thousands (if not millions) of formulas. The only way you can do it is by triangulating numbers and by making sense of what they mean for business. Ask yourself, can I reach this number through a different framework / calculation? Do the numbers tie up or they are different by a magnitude? Are there process dependencies which can give you a sense of numbers? Can you issue 2000 credit cards every month, if you only get ~1800 applications every month? What do these number mean for business? Do they tie in with the infrastructure and resources business has? Triangulation is like any other skill, it will look difficult to start with. But the more you practice, the better you become at it. One of the leading travel portal in India saw this in their data: 90%+ flights booked have departing location same as city from which tickets are being booked (determined by the I.P. address). They thought of making this location pre-populated (obviously with an option to change). This sounds like a nice idea which would help provide a better customer experience. Thankfully, they tested it out. Booking conversion dropped by double digit percentage with in weeks of making this change. Possible reason: The customers are used to filling To and From location. Removing one of them adds to the confusion. So, next time if you are implementing results from any analysis or hypothesis, test it out! While this habit will not bear immediate results like other habits mentioned above, you will benefit the most from this in long run. Analytics is a dynamic and evolving field. A new tool / technology / update arrives almost every 2 – 3 months. Being up to date with latest updates in industry helps not only stay on top of it, but creates a huge gap from analysts who don’t stay updated. What are the latest developments in Big data? How to analyze unstructured data from Social media? How can we make visualizing this better? What are the statistical concepts behind the algorithms used by various tools? How can you design and analyze a design of experiments? Start reading and you are bound to run out of time! Additional Habit: One additional habit worth mentioning is “Being customer centric”. Hearing what the customers are saying and keeping that in mind is a trait of every successful professional. The same applies to an analyst. Since it is not an analytics specific habit, I have not mentioned it in the list. While the list of habits could have been lot longer, I have deliberately restricted it to 5. If you think any other habit, please add them in comments. Taking a new job in Analytics? Ask these 5 questions first! 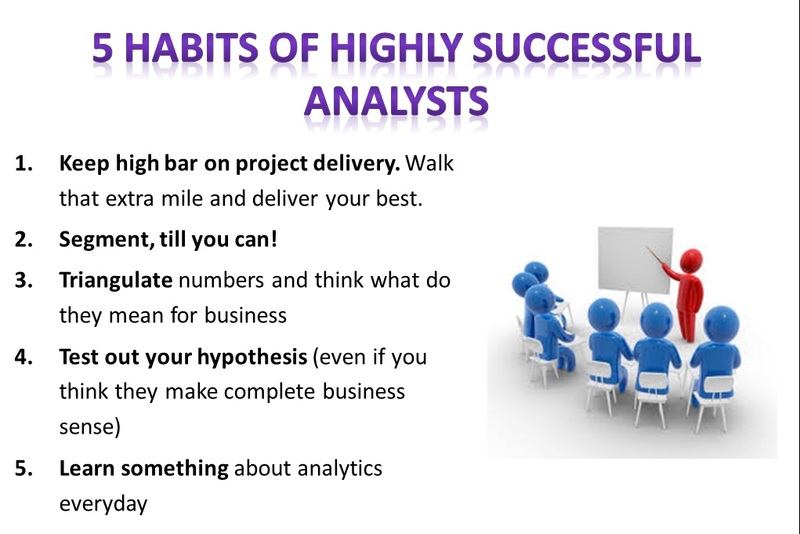 All 5 habits successful analysts put into place. Question lingering in my mind that a project awarded to a develop a application to a company, without knowing the strength later it was noticed that they do not have domain expertise totally different domain from (Financial to Telco). So my question is how segmentation comes into effect in these type project scenario. Pls. Comment. * Spend time understanding the business by spending time with customer and the team responsible for MIS / Analysis. This should provide a good list of hyoothesis to start with. * Go back to customers with you findings on segments and sub-segments, validate the findings and agree on a segmentation which works for them. Hope this answers the question. If I have mis-understood, please let me know. Nice article! Interesting tidbit about the travel website!! very useful post indeed; looking for a separate post on “triangulating numbers” with some real life examples. please share the link if its already there. I would like to go one step ahead- How to measure analyst’s performance ? Would like your input in designing the performance evaluation criteria-KRAs with target for the team members working on business analytics project and also doing standard reporting. Could you please suggest few relevant , effective and measurable KRAs to guage one’s performance in order to recognize people performance appropriately and unbiased. Any input on this subject is welcome. Very relevant question. I would say that performance management is not just the function of team you are part of. Typically the evaluation has a lot of other factors – like whether the company fosters innovation or accuracy in repeatable tasks? Whether the company provides freedom to ask questions or just want the analysts to follow an expected track (a recipe for disaster). Here is an article, which might provide an overall picture. One suggestion. When you say: “an analyst asks some of these questions to himself”, it would be better to say “an analyst asks some of these questions to himself/herself”, as there are also female analysts.